This was my first year at Camp Adventure. I was 18. I loved it. I loved it so much that I have been back every summer since then. If you know a middle-schooler, or are a middle-schooler, Camp Adventure is the place to be this summer! Wahoo! Where do you send the kids when you two are at Camp Adventure? Where do you send your kids for church Summer camp? My oldest (8 1/2) is dying to go. Ever since I was in second grade, I’ve spent at least part of my summer at camp. I’ve spent the last several summers doing camp ministry at different camps. I’m so excited to add Camp Adventure this summer! It is going to be great. The girls have gone with us every summer. Not sure about camp for younger kids. I’d ask Miss Jen or Miss Elizabeth. Miss Jen suggested one called Lakewood. I think Cyra is a little leary since she doesn’t know anyone from GCC who is going. So cool that you are able to take them with you. I can’t wait for Camp! 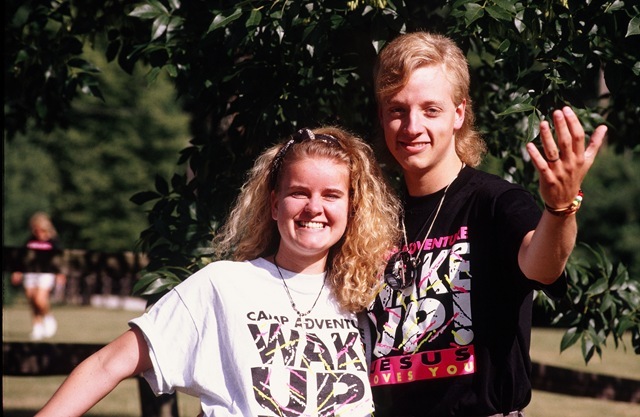 Sheila and I will be with you guys as we invest a week of time, effort and love in MIddle School students this summer. We look forward to camp’s “adventures” with your precious family. You guys are loved. J and I saw a kid with the shirt Rob is wearing in that picture last year at HaniYori! He had the same haircut too!! !